The same centrifuge or whirlpool model of ether, that I have proposed earlier to explain gravity also explains the other two mystical phenomena in Nature i.e. electricity and magnetism. 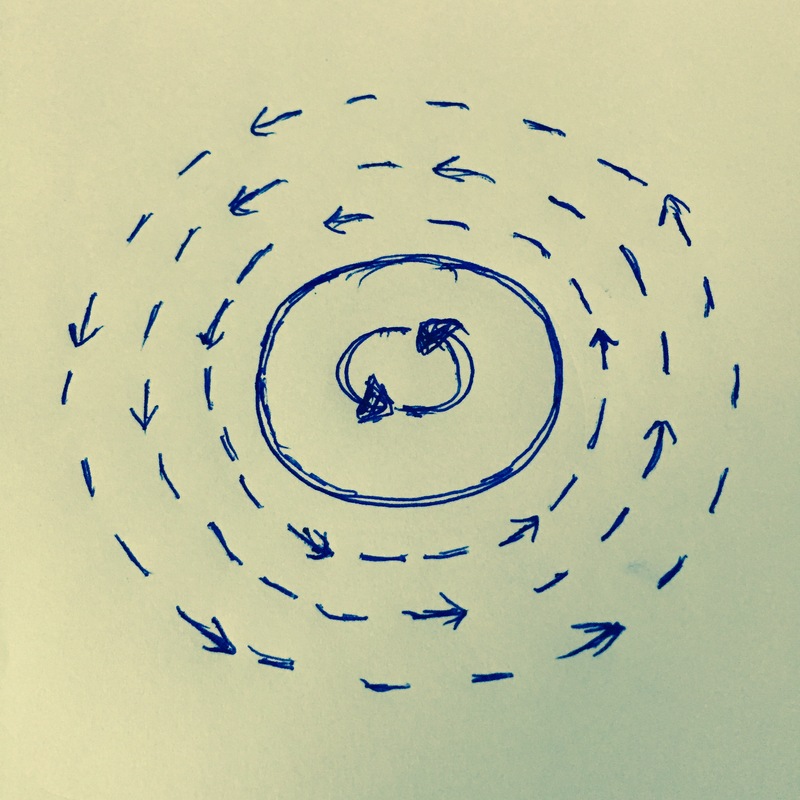 It appears that gravity represents the sum effect of the electric and magnetic ‘fields’ generated by a spinning body. Electric charge: Imagine a ballI spinning in a pool of still water. The ball generates circular water currents around itself and drags objects in its vicinity towards its equator (see page Gravity and Bernoulli Effect). This effect is what probably manifests as electric charge. The so called positive and negative charges could just represent particles spinning in opposite direction in the Ether medium. So while ‘electric charge’ phenomenon explains the gravitational force near the equator, the phenomenon of magnetism explains the gravitational force near the poles. 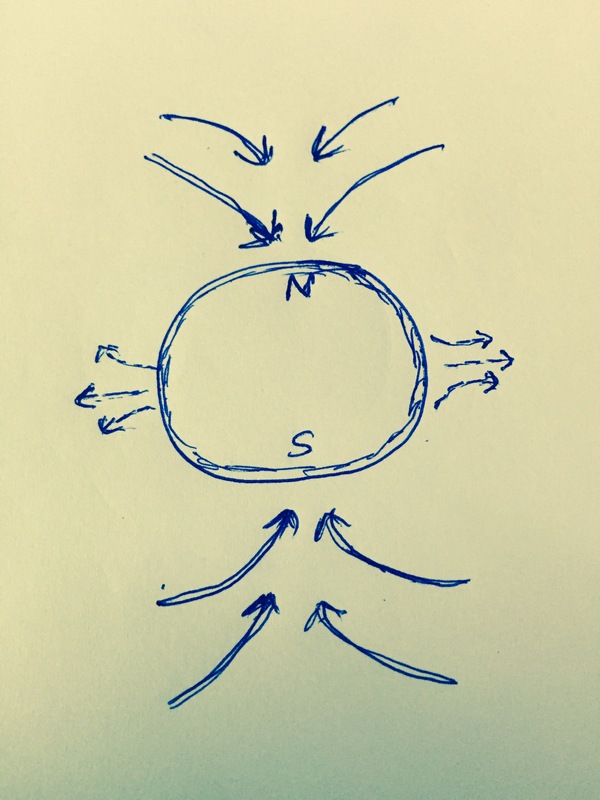 The above model explains why magnets always exist as ‘dipoles’ unlike the electric charges and also explains the perpendicular orientation of electric and magnetic fields to each other. So the earth acts like a magnet because it spins. But how does a bar magnet which is stationary acts like a magnet? Well, we could explain its magnetic behaviour by the sum effect of the spin of all the particles/ atoms that make up the magnet. Why doesn’t a magnet attract all kinds of objects? It could be that the internal configuration of some materials is such that they generate an ‘ether milieu’ which doesn’t ‘yield’ so easily and hence stay uninfluenced unless the external influence is much stronger. We can offer a similar explanation for why a charged particle doesn’t attract every massive body unlike the earth. Moving charge and magnetic field: When the charges (electrons) in a conductor are not flowing (i.e. when there is no current), they probably exist in a state of random distribution/ random configuration in the conductor and may not produce strong ether currents in the neighbourhood of the conductor. But when the charges start flowing (i.e. when there is current), they all probably get configured and spin in the same direction as they flow through the conductor. The sum effect of all these flowing and uniformly spinning electrons generates ether currents (in spiral motion) around the conductor. That explains why moving charges generate magnetic field and not stationary charges.